It’s with warm greetings that I welcome you into the new year and thank you for all that you have made possible in 2018. Last year with your support, we transformed the lives of 3,225,033 people. As we reflect on these numbers, we remember that it was not that long ago in 2015 that we were at an inflection point at RestoringVision. We made a commitment to grow to help 1 million people in need access glasses and transform their lives through clear vision. That year, our donors and service delivery partners stepped up to the challenge and together, we grew to help 2.5 million people. Since then, we’ve continued to grow and we’re continuing to make a difference in people’s lives every day. None of this would be possible without your commitment, dedication, and contributions. From our donors, who provide glasses and support our work, to our more than 1,400 service delivery partners, who work with us to get glasses to the people who need them most, I thank you. Simultaneously, I ask you to keep the momentum going. I’m confident that together this year, we can make even greater strides in creating access to glasses for people living in some of the most impoverished communities around the world. As always, thank you for your partnership and support. RestoringVision has partnered with nine optical organizations and the Bangladesh Ministry of Health and Family Welfare for an innovative project titled the Clear Vision Collective (CvC). The goal of this project is to bring the gift of sight to people in need across Bangladesh. We anticipate that over 80% of the individuals we serve will be receiving their first ever pair of glasses through this program. Click here to learn more about this impactful initiative. We’re excited to announce that we’re offering two new supplemental reading glasses packages in an effort to better serve our partners who are serving a primarily younger or older population. These packages are the perfect add-on to your standard orders, helping you ensure that you have enough glasses for the specific needs of your trip. Our low strength supplemental package includes 100 pairs of glasses from +1.00 to +2.00 diopters. Our high strength supplemental package includes 100 pairs of glasses from +2.25 to +3.50 diopters. To order the new supplemental packages, click here. Some of our most popular glasses strengths are back in stock. You can once again order reading glasses in the powers +2.25, +3.00, and +3.50. We also have a limited supply of +4.00 reading glasses available to order. Visit our shopping cart to place your 2019 orders today! To read the full version of our newsletter, please click here. The year-end holiday season is a time for individuals and organizations to reflect upon the past 12 months and celebrate with family and friends. As families gather around the table and organizations host events and parties, this yearly reflection generates an added spark. It inspires many to help people in need around their communities and the world. On top of this, in order to qualify for a tax deduction during the impending tax season, companies and individuals are required to make their yearly charitable contributions prior to the turning of the calendar. As a result, most individual and corporate donations happen between #GivingTuesday, or as we put it here at RestoringVision, #GivingSightDay, and the end of the year, December 31st. For those who decide to partake in this year-end charitable giving season, it’s important to spend time researching the right nonprofit organization to donate to. We encourage companies and people to investigate and ensure their donations are going to charities and causes that are most important to them, their families or their organizations. Every single day, millions of people around the world are in some way touched by a nonprofit organization. Whether it’s a community-based program, a healthcare program, a food program, or an educational program, nonprofit organizations build vibrant and improving communities around the world through the power of donations. These nonprofit organizations support health, safety, and education in communities that might otherwise lack the capability to provide it. Nonprofits are the foundation of global health and wellness to protect our planet and future generations. While issues like hunger, AIDS, Ebola, and Malaria are rampant on the news and around the world, there are issues, such as poor vision, that have been neglected in the past, but are gaining attention in recent years, and for good reason. Imagine a world in which you didn’t have access to the tools you needed to properly see. Vision is one of our most important senses and as humans we are extremely reliant on our ability to see, which is evident in how complex our eyes are. But as you read this today, over 2 billion people worldwide suffer from an uncorrected vision impairment, and of those upwards of 544 million people only need reading glasses to make the correction but live in impoverished communities lacking access to these life-changing items. Health – Reading glasses make the vision correction needed for people with close range vision problems. Education – Both children and adults benefit from near vision correction, giving adults the ability to work, read, learn, and perform daily tasks without keeping children away from school. Adults can also enter continuing education and workforce training. Safety – Having clear & focused close-range vision is essential to safely completing hand held tasks and providing for one’s family, such as caring safely for a small child. Productivity – Vision correction leads to a 35% increase in productivity and 20% increase in wages. A simple pair of reading glasses gives people the ability to carry out their daily tasks, work, and lead productive lives. Quality of Life – Regaining the ability to see clearly boosts the morale of individuals and allows them to become contributing members of a family or community once again. Overall Community – By providing glasses to impoverished communities without access, it boosts their education rate, median income, economic output, and the overall health of that community. The good news is in 2018 there are plenty of ways to get involved during the holiday season, or anytime, and help restore vision to people in need around the world. Organizations like RestoringVision are dedicated to correcting vision and providing reading glasses to people in communities that otherwise lack access. You or your organization can join forces with us this giving season and help in three different, but effective ways. First, you or your organization can Become a Partner. RestoringVision has a strong network of partners who help in the distribution of glasses to impoverished communities around the globe. Our partners are the ones on the ground taking the glasses overseas and putting them on the faces of people in need. If you are a non-profit organization or mission group looking to make a difference in the world, becoming a partner with RestoringVision is a perfect fit. Second, you can Become a Sponsor. At RestoringVision we are lucky to be blessed with an amazing group of corporate sponsors. These sponsors not only help provide access to glasses for people in need, but also help us create access to health, education, work, and a better life for these same people. If you are a corporation embarking on a corporate social responsibility program, consider working with us. One for One Program: The sale of a unit of your product will result in a donation of a pair of glasses to someone in need. This is RestoringVision’s take on the classic buy one give one program. When a customer buys a product, our sponsors make a monetary donation to RestoringVision, which we then convert into a pair of glasses. Direct Giving Program: Our sponsors can make a direct cash donation that will immediately go to the purchase of glasses for disbursal. In-Kind Program: RestoringVision makes it easy for manufacturers, wholesalers, and retailer sponsors to donate their excess inventory of reading glasses or new sunglasses. Lastly, you can get involved by donating to our cause and helping RestoringVision empower lives by giving the gift of sight to people in need around the world. Make a tax-deductible donation today and every dollar you donate will be converted into glasses delivered to people in need. Remember, this holiday season while reflecting on the memories of the past year, carry on the tradition of giving. Whether you donate with your family or through your company or organization, consider helping those in need see and live better. There’s no better time to spread the spirit of the holiday season and make a lasting, positive, impact in people’s lives. The happiest of holidays to you. Another incredible year comes to a close. When I reflect on the accomplishments of this year and our tremendous progress towards reaching our goal of helping 20 million people see clearly by 2020, I have an overwhelming feeling of gratitude. Gratitude that RestoringVision has been able to celebrate 15 years of helping people in impoverished communities see and live better. Gratitude for the trust and hard work of our service delivery partners who take glasses to the field. Gratitude for the generosity of our sponsors and donors who support our work. Gratitude knowing that behind every pair of glasses we provide is someone whose life has been transformed through the gift of sight. We couldn’t have done this without you. As you celebrate with family and friends this holiday season, please take a moment to reflect on the good you have done to make the world a better place. Whether you took glasses to the field, you donated or told someone about RestoringVision and the work that we do, you made a difference. Cheers to you and best wishes for an amazing 2019! These last two months have been very special for RestoringVision. I celebrated our 15 year anniversary in Yucatan, Mexico, where we helped over 800 people in five villages see clearly again. 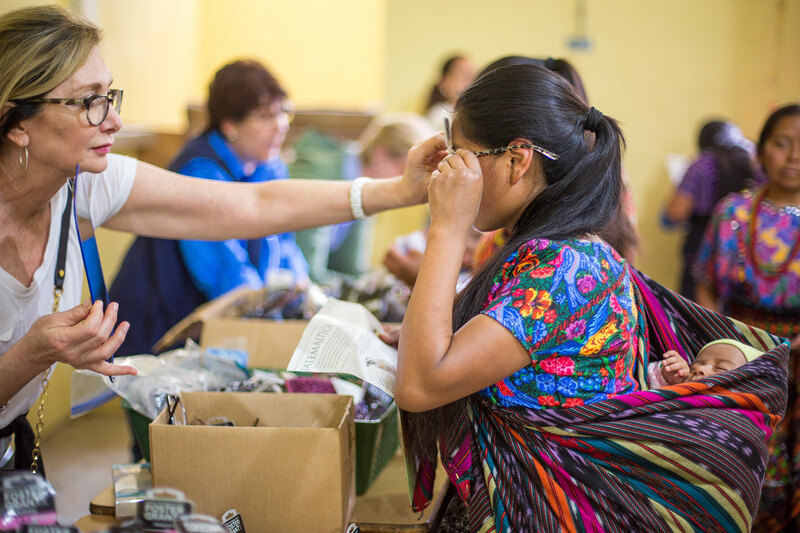 The trip was especially meaningful to me as it was on a mission trip to Mexico when I first observed the significant need for reading glasses in impoverished communities. It was on that trip that I was inspired to create RestoringVision. It was also great to see everyone participating in World Sight Day last month. Thanks to your support, we were able to bring attention to the serious global problem of uncorrected near vision impairment that affects over 500 million people who lack access to a simple pair of reading glasses. In this month of thanks and giving, we are looking to help even more people by once again turning #GivingTuesday into #GivingSightDay with you. We hope that you will join us in raising funds and awareness. Together, we can work towards a world where every person who needs glasses has them. As always, thank you for your steadfast partnership and support. We couldn’t do it without you. Let’s Turn #GivingTuesday into #GivingSightDay! Mark your calendars: #GivingTuesday is coming up on November 27. For the third consecutive year, RestoringVision is turning #GivingTuesday into #GivingSightDay. Our goal is to raise $30,000 to transform 40,000 lives through the gift of sight. We hope you will join us in this celebration of giving! Donors and supporters: You don’t have to wait until Nov. 27 to help us reach our goal. You can click here to donate now. Thanks to National Vision, Inc., the first $10,000 raised will be doubled! Service Delivery Partners: We’ll once again have our exciting GSD promotion for you on Nov. 27. Be on the lookout for a special email with the details. In the meantime, be sure to add #GivingSightDay to your calendars. Poor vision is a global health problem that is just beginning to gain recognition. In his book “Clearly”, philanthropist and businessman James Chen shines light on the importance of access to glasses through testimonials of individuals affected by vision impairment. RestoringVision is grateful to James and Vision For A Nation for allowing us to share an excerpt of this impactful case study. To read it, please click here. For all of our service delivery partners, we have created a new manual with the most useful tips that have helped our partners to successfully dispense reading glasses. To view and download this document, please click here. Chen, J. (2017) Case study v Felicien. In Clearly. Biteback Publishing Ltd.
Poor vision is one of the biggest unaddressed global health problems that recently has been gaining more and more attention. The extraordinary book Clearly by businessman and philanthropist James Chen addresses this health crisis through the personal stories of individuals affected by vision loss. The story of Felicien is particularly special to RestoringVision since it is about near vision impairment. Felicien is a father of seven children living in Kigali, Rwanda, who feared his deteriorating eyesight would cause him to lose his job. Thanks to the work of Vision For A Nation, Felicien learned that he just needed a simple pair of reading glasses to restore his vision and remain a productive member of his family and community. Through our network of non-profit partners, corporate sponsors, individual donors, and supporters, RestoringVision is proud to impact the lives of people like Felicien by providing new, high-quality reading glasses to people living in impoverished communities around the world. Our vision is a world where every person who needs glasses has them, and through the increased recognition of our cause, we believe we can make that vision a reality. Read Felicien’s full story on the slideshow above. Thank you to James Chen and Vision For A Nation for allowing us to share this impactful case study. To learn more about James Chen’s book Clearly, please click here.